Long-term standing or sitting, pregnancy, dysfunctioning vein valves, and increased sodium intake or drugs can all be behind leg pain and swelling. Persistent pain and swelling can lead to further complications such as varicose veins, thrombosis or other diseases. If you are suffering from persistent swollen and heavy legs, now is the time to find a solution. When you are standing or sitting down for long periods of time, vein walls tend to increase in size. They are weak, they lack elasticity and can’t hold the liquid gathering in lower limbs. As a result, legs become swollen, heavy, and full of water. 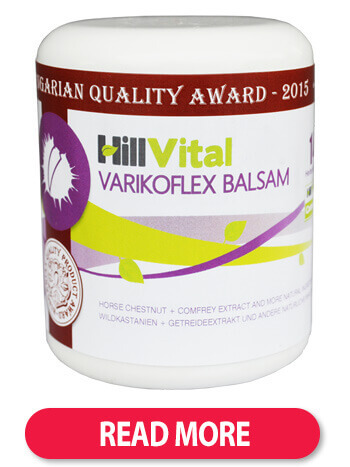 Our Varikoflex balsam contains 12 healing herbs and a high concentration of horse chestnut, is ideal for a natural treatment of heavy and swollen legs. This special combination can provide relief to swollen legs. Our balsam does not contain any perfumes, parabens or colourants. Healing herbs can provide effective help from within in the form of our herbal tea - Tea Flex. Tea Flex for varicose veins and swollen legs contains raspberry, blackberry, blueberry leaves as well as marigold and wild pansy. It is necessary to provide legs with sufficient relief from swelling by preventing the weakening of vein walls and strengthening them at the same time. 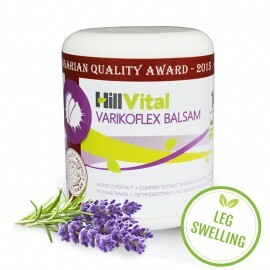 Our unique combination of Varikoflex balsam and Tea Flex will help heal your swollen legs. In the case of persistently swollen legs, we recommend increasing your vitamin intake. 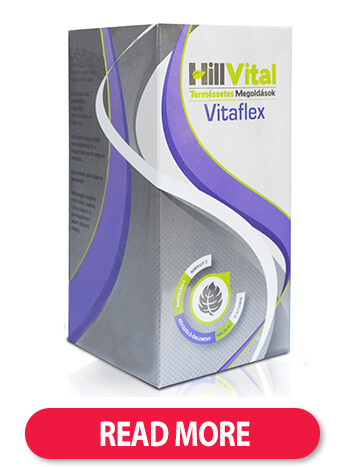 Vitaflex contains all the necessary vitamins that help with natural treatment. If you are suffering both from swollen legs and cramps, try helping your body from within. A powerful combination of calcium and magnesium make up our vitamin/mineral pack Calmag+D3 which will support your fight against swelling and cramps. Effective natural solution for swollen or heavy legs, HillVital products can help you overcome the discomfort, health risks and feeling of heaviness. Varikoflex cream for knee swelling, ankle swelling and swollen legs Eliminates leg swelling..
Varikoflex ointment for swollen legs, knees and ankles helps relieve problems with swelling, pain and heavy legs. Varikoflex eliminates leg swelling, relieves tension, helps reduce heavy leg feeling. 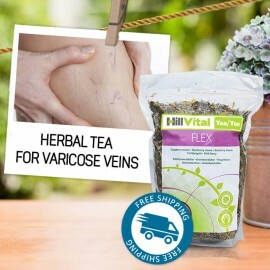 NATURAL HERBAL TEA FLEX TREATMENT FOR VARICOSE VEINS, SWELLING, AND HEAVY LEGS. 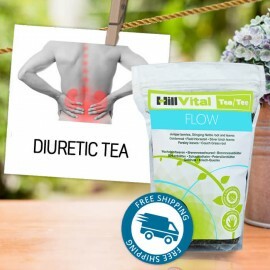 Our Tea for var..
For natural herbal treatment of varicose veins. Mixture of properly selected 5 herbs helps heal from within and thus treat varicose veins, tighten venous membranes and improve vein elasticity. Herbal tea for kidney cleansing. Natural composition of 8 herbs is the right choice in detoxifying and dehydrating the organism. Helps with inflammation and disinfecting of kidneys and the urinary tract. Vitaflex - 30-day vitamin pack for varicose veins Vitaflex is a vitamin package made for the tr..
Complex vitamin pack for varicose veins. 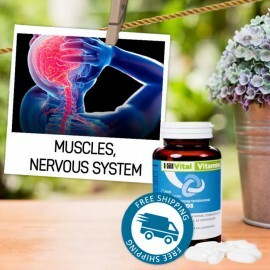 Unique combination of healing plants and food supplements strengthen veins and provide them with elasticity. Our vitamin combination strengthens venous membranes. Swollen legs do not only cause an aesthetic problem but can also be very painful. Often they can be symptoms of a serious disease. Liquids gather in the soft tissues and cause legs to swell up. Faulty functioning of the venous or lymphatic system can also stand behind the swelling, not to mention health issues associated with the kidneys, heart, liver or malfunctioning of a thyroid gland. Several reasons could stand behind leg swelling. It can affect one or both legs and the pain can sometimes travel through the body starting in ankles. How to treat leg swelling? The first step when experiencing swollen legs is to find out the cause. It is important to identify whether the cause is associated with orthopedic problems or if there is an underlying disease. In case of repeated swelling, it is time to visit your general practitioner, who will then suggest medical tests and will recommend treatments based on your specific case. Different causes are investigated through a veins and limbs ultrasound, blood analysis or a thorough examination. Occasionally, you will have to pay a visit to specialists to find out the cause - special medical departments such as department of angiology, dermatology or orthopedics can help you. Based on the results, the doctor will then prescribe the proper treatment. What helps with swollen legs? 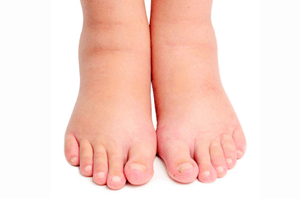 Sedentary occupations or occupations that require a lot of standing can be behind swollen legs. Lack of movement also contributes to the swelling. Exercise and move your legs. (tips: opt for the stairs instead of the elevator, walk to and from work, switch up your legs positions). Pregnant women also suffer from swollen legs especially in the 2nd and 3rd trimester. The woman’s body tends to hold on to excessive water during pregnancy. How to reduce swelling during pregnancy? Frequent switching up of the body position and going for walks could help. It is also recommended to receive sufficient amount of water every day. How to avoid swelling? Monitor your salt intake. It is recommended than men consume no more than 10g of salt and women 8g of salt per day. Enrich your diet with foods rich in potassium. Try to also consume parsley, avocado, tuna, spinach, chive or banana. In addition to potassium, increase also your intake of magnesium. Consume more of beans, nuts, eggs, or yoghurts. Magnesium positively affects swelling and cramps. One of the reasons why people are experiencing swelling is lymph malfunctioning. We recommend trying a lymphatic massage. Working out can also help as you improve your blood flow in the whole body. Blood is generally pushed down due to gravity. Try also switching up between hot and cold water so that your legs stay replete. Apple cider can be of great help as well. Try rubbing the affected spots with apple cider or you can also soak them in apple cider water. Don’t forget creams and wraps. Try also willow bark, aloe vera, camphor or marigold. They alleviate swelling and pain.